Home > Selected Excerpts > From: Nothing twice. The Management seen through the poetry by Wisława Szymborska. Nothing twice. 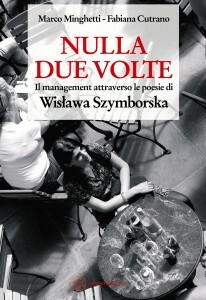 The Management seen through the poetry by Wisława Szymborska. The book is based on 25 poems by the 1996 Polish Nobel Prize Winner Szymborska with comments by Marco Minghetti and illustrated with photographs by Fabiana Cutrano. In addition, it contains other reflections by many personages of culture and enterprise. Poems, images and comments are organised and divided following five managerial themes: conviviality, individual motivation and the development of interpersonal relationships, Knowledge management, diversity and creativity, “sense making”. Because enterprise is not a static and immutable machine but more a vital world in continual evolution, poetry can reveal itself as an efficient key to interpret complexity.